You really have to love any plant that has "passion" and "flower" blended in the same word. This little vine is a powerhouse of good characteristics that makes it worthy of its own little trellis or a spot along your fence -- or around your mailbox post. This American native is the state flower of Tennessee and grows wild there and points south. Passionflower is more than a big purple climber, though. It's has medicinal properties worthy of a spot in your landscape. There are a number of passionflower varieties, and we're featuring Passiflora incarnate today. If you're having trouble relaxing in the evening or dropping off to sleep after a long, evil day, passionflower may be able to help. Passionflower isn't fussy. Provide light soil that drains well (pH 6.1 to 7.5.) and keep the plant moist. Passionflower likes sun but will tolerate partial shade. It's accustomed to poor soil, so give it a deep hole filled with sand and other soil lighteners, but don't pamper it too much. Consistent watering is a good idea, but this isn't a persnickety plant. 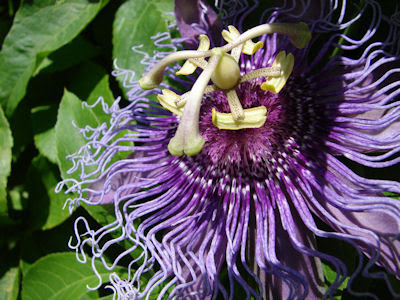 Although there are over 400 varieties of passion flower, many, like Passiflora incarnate, are vines that grow to 30 feet. Passionflower is considered a warm weather Southern belle, but it can take winter temperatures into Zone-5 as long as you give it a protective layer of mulch before you put the lawn furniture in the garage for the season. Propagate passionflower from seed, by layering or from cuttings. I use the cutting method because it's easiest for me. I take six to seven inch cuttings in fall from mature plants and root them in perlite, vermiculite, or sand -- whatever I have on hand. I've used rooting hormone -- and not used rooting hormone. If this is your first time, it's a bit of extra insurance. I try to take cuttings in early September, but always before the first frost of the season (if you garden, you know about watching the weather report). I bring seedlings indoors to overwinter and plant them out in the garden the following spring. Another option, especially if you don't want to babysit a seedling nursery over the winter months is to cultivate new plants through layering. Just strip leaves from a section of stem and bury the stem under an inch of soil. Keep it in place with a smooth (not too heavy) stone or a garden bobby pin -- those metal loops that keep garden fabric in place. With regular watering, a prepared section of vine should root in a few weeks. After adding a layer of mulch, it should make it through the winter and be ready to transplant in spring. If you want to try starting passionflower from seed, harvest the seed pod from a mature plant and remove the seeds from the gelatinous aril (the glop is very tasty, btw). Dry seeds in a warm, dark place and plant them out in sandy soil next spring after giving them a soak in water for a couple of days. Planting passionflower seeds is a little like watching the grass grow, though: seeds can take up to a year to germinate. That isn't a typo. Put seeds in an attractive, shallow pot and hunker down for a long wait. If it seems like a royal pain, just imagine the payoff when those green shoots finally poke their heads out of the ground. Passionflower takes to a pot well as long as you can keep the accommodations consistently moist. Some gardeners prefer to pot passionflower and then bury the pot in the garden to keep the plant from growing out of control. Others living in cold areas prune the vines back and bring plants indoors over the winter months. If you think watering might be a problem, invest in a self-watering pot and make sure to add moisture beads or a layer of mulch to your setup. Strip leaves from the plant in fall and dry them in a dehydrator, on a drying screen or outdoors in a paper bag (a single layer of leaves at a time). Place dried leaves in an airtight container and keep in a cool, dark spot. Here we get to the payoff of growing passionflower. It is a restful herb that calms the nerves and will help you sleep. Until the late 1970s, it was a common ingredient in OTC drugs designed to promote sleep, but a lack of adequate research (not the discovery of problems or lack of effectiveness) led to its falling out of favor in the U.S. There seems to be more interest in the pharmacological properties of passionflower in Europe where popular sleep aids are extracted from the plant's leaves. Although it can work alone, you'll get more benefit using passionflower in concert with other sleep inducing herbs like valerian root or lavender -- my favorite. According to Consumer Reports Health, the Natural Medicines Comprehensive Database rates passionflower as possibly effective for treating anxiety, and there is insufficient research to rate it for treating insomnia and other conditions, like: hemorrhoids, heart problems, high blood pressure, fibromyalgia and seizures. It is considered likely safe for use by most people when taken orally in small amounts and is considered possibly safe when used short-term as a medicine. Passionflower contains small concentrations of harmala alkaloids, potentially toxic substances when ingested in large amounts or concentrations. Because there is some potential for abuse, passionflower is considered unsafe to use over a long period of time (defined as a month or more). You can make a sedative tea by adding 8-ounces of boiling water to a teaspoon of dried passionflower leaves (place the leaves in a tea ball or muslin bag). Let steep for five minutes. Limit the dosage to one cup about an hour before bedtime. Caution: Medicinal passionflower shouldn't be ingested by pregnant women or women who are breastfeeding. Avoid passionflower if you are on anti-anxiety or anti-depression medication. If you are new to passionflower, avoid driving or operating heavy machinery until you know how your body will react to this herb. Some people have reported extreme fatigue, fogginess and an inability to concentrate. If you have insomnia, heart palpitations or any other undiagnosed symptoms, seek the assistance of a medical professional. On a side note, the large, showy flowers of passionflower make a friendly display on a fence or trellis. Many herb plants have puny and unimpressive flowers, but passionflower really puts on a show. It's worth a spot in your garden for that alone. Keep an eye on it, though. Passionflower can become an invasive pest if left unchecked over a few seasons. Consumer Reports Health. "Passionflower" Undated. (3/15/11). Lerner, Rosie B. "Propagate Herbs Now For Yearlong Enjoyment." Purdue University Consumer Horticulture. Steven Foster Group, Inc. "Passionflower - Passiflora incarnate." Undated. (3/15/11). United States Department of Agriculture. Purple Passionflower (Passiflora incarnata L.) Undated. (3/15/11). WebMD. "Passionflower Overview Information. 2009. (3/15/11). Thank you for all this information on the Passion Flower. I started growing mine last spring and have fallen in love with them. We bought 3 more for our back fence (big fence, haha)I love their color, bloom, and most of all hardiness. Unfortunately one of ours was damaged by our lawn care people and was chopped off at the ground. I was wondering if these plants are able to recover from such a brutal pruning. I live in eastern Texas and have sandy loamy soil. I planted just one plant around three years ago. I just finished cleaning out hundreds of these plants after our first frost. Heed the writers warning above they will grow to an uncontrolled level if left unchecked. I've cut my passion flower plants pretty aggressively in the past -- to maybe three or four inches above ground level -- and they've came back strong. Depending on the location, how well the root system has developed and how accommodating the weather decides to be, I think your plant has a good chance. Maracuya is the Spanish name for the fruit of passionflower,in some countries, is widely use in juices, and other beverages, jams and candied, I just eat it right out of the vine when is riped. This isn't the state flower of Tennessee as the article says. The purple iris is. Correction.. FYI, actually... The Passion flower IS the State of Tennessee's official Wild Flower... the Iris is Tennessee's Official Cultivated flower. Tennessee echinacea is also an official Wild Flower of the state... but.. The Passion flower was the states first Official flower (1919)... the Iris was adopted as a official state flower in 1933. Thanks for commenting about this. Actually, Tennessee has two state flowers as I understand it -- a cultivated state flower and a wild state flower. The cultivated state flower is the iris. The wild state flower is the passionflower. At one time passionflower was Tennessee's only state flower. I think that may have changed in the early 1970s. Thanks for helping to clear this up. My experience is they are very, very hardy even in clay soil. I LOVE it. Have one in a large pot since I am anticipating moving soon & it's very happy. Where I live (N. CAL)it doesn't die back completely in the winter. I grow passion flower vine for caterpillars to eat. They completely devour the leaves every summer and the vine comes back fuller every year. It can take over an area easily. I will try to save some of the leaves for tea this year though. I find the passionflower vine very hardy, also. It grows in the cracks in concrete around a pond and hangs over the edge.It is beautiful and is the host plant for Gulf Fritillary butterflies.It reseeds every year by itself. I end up pulling it up out of the grass (easy). Dear Sara ,iLive in Ft.Wayne Indiana Ithink iam in zone 5 Iread that u need to be in zone 6and above to grow passion flower vines outside if Iplant up close to my house outside will it be ok? The USDA plant profile for passionflower shows its distribution throughout Indiana (http://plants.usda.gov/java/profile?symbol=PASSI), so you should be okay. The plant hardiness map places Ft. Wayne in zone 5b (which is chilly). Placing a layer of mulch on your vines for winter protection is a good idea -- even though your plant is near the house. I'm also in zone 5b, and my passionflower vines do just fine. I mulch them with straw every fall, but any garden mulch product should work. Good luck. You're in zone 6 (either a or b). That means you're just out of the recognized temperate zone (7) for reliably growing passionflower as a perennial. I'm in zone 5 (even less temperate), and can grow it in a sheltered spot in my backyard. If you can find a nice location away from the wind and somewhat protected by, say, a semi-solid fence or wall, you probably have a good chance. Provide plants with a nice layer of mulch in the fall to protect their roots. If growing passionflower as a perennial (perpetually growing from season to season) doesn't work, you can also plant it as an annual every year. You can find a zone map here: http://planthardiness.ars.usda.gov/PHZMWeb/. I did the same thing this year and it has been blooming it's heart out since February . In late Fall, I uprooted the plant, threw it in a pot and stored it in my garage till January when I cleared enough space near a sunny window to bring it indoors. It is still flowering and I an=m wondering itf it is time to move it out or if it will suffer! Mine died this year because I might have rushed in putting it out in the garden. Does anyone in Central jersey have one they can share? You need around six inches from the tip. Since passionflower vines can get pretty long, that coveted plant could make it to your side of the fence in no time. Although layering or taking spring cuttings is best, you may be able to start a new plant indoors in moist sand or perlite. If it gets really hot where you are, this may be the best approach. As a little extra added insurance, roll the root end in a little cinnamon, first. (It's a convenient and safe rooting compound.) Good luck! This is a great blog. I have a question regarding the harvesting of the leaves to use in tea. I have a passion flower vine in a large pot. I have been using a flowering plant fertilizer (not a natural product) every 3 weeks or so. Would it still be safe for me to use the leaves? Also can you dry and use the flower for tea? I don't know if there are additives in the flower fertilizer you're using that could potentially cause problems. You're best bet is to contact the manufacturer and ask. You can also comment back with the brand name. Another reader may have additional information. Hi! I cannot get my passionflower to bloom. It's in a sunny area (afternoon sun) and the vines are over 12 feet long, and thick! There are two plants completely covering both railings of a flight of stairs, and not one bloom. I even tried fertilizing one plant and not fertilizing the other- they look exactly the same. This plant did provide me with a couple of blooms when I first got it and kept it potted a couple of years ago, so I know it's capable- this is the first year I tried growing it in the ground. What am I doing wrong? I'm in Rhode Island, zone 7a. I'm going to try to cut it back and mulch heavily this winter and see if it survives, but I would like to try to get it to bloom next year! Provide good light for 6 to 8 hours a day. Prefer a soil pH between 6.0 and 7.5. Use a timed released fertilizer if you have poor soil, and apply it sparingly. Avoid high nitrogen fertilizers as they may stimulate leaf rather than blossom growth. Promote good air flow by keeping plants spaced well. Mulch plants for moisture retention and winter protection. Start new plants every few years as older plants may tend to blossom less over time. Hi Sara, I love my passion flowers. For me, they bloom every season. I was hoping you could advise if there's anyway to prevent the caterpillars from eating all my leaves. I don't mind sharing, its just so sad seeing my vine go from flourishing to nearly dead. Thanks in advance! I like to place a couple of bird feeders in the general vicinity to keep caterpillar populations under better control, but if you have Gulf Frittilary butterflies, they're poisonous to many predators and typically get a free pass in the garden. To reduce a Gulf Frittilary butterfly larva population, you can pick them off with your hands or fashion traps. It's a shame to use insecticide, but that's an option too -- if you're really determined. Here in Hawaii we call it "Lillikoi" and it grows like the monster plants in the "Little Shop of Horrors". Black ants are all over it, though, seemingly feeding on something in the proto-flower bulbs. It's taken over my Plumeria tree in the front, and I've successfully grown four vines that frame/cover my porch just off my bedroom. Passionflowers, too, are just amazing. Thank you for posting this. I can't wait to establish a passionflower vine on my fence. It's a neat plant, you'll enjoy it. To me, it manages to look exotic and cheerfully welcoming all at the same time. I found several plants growing wild along roadside here in southeast Georgia and I pulled several up that are now sitting in water till I can plant them. Plan on going tomorrow to dig some up to get more of the roots to plant along my front fence. The flowers are beautiful and smell absolutely wonderful. Thank you for this informative article. I first learned about the Maypop Passionvine last year when I found some in our natural and wild field. I was afraid to dig it up, so I ordered a plant this from a nursery. The Maypop is the only one that is hardy in SW MO. This article will help me greatly after I plant it. I was never aware of its tea value. Do you cut back the vines at the end of the season? In warm climates, let it ramble. In cold climates threat it like an annual: let it self seed every fall, or bring it indoors for the winter.